Is Faculty Approval Evidence of Successful Information Literacy Instruction? 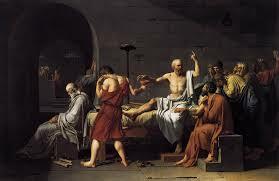 There’s a scene in Plato’s Crito – the one where Socrates is about to be sentenced to death by hemlock for the crime of corrupting the youth by asking them questions about how to live – where Socrates’ friend Crito is more or less begging Socrates to escape from prison and go into exile. For I am and always have been one of those natures who must be guided by reason, whatever the reason may be which upon reflection appears to me to be the best; and now that this fortune has come upon me, I cannot put away the reasons which I have before given: the principles which I have hitherto honored and revered I still honor, and unless we can find other and better principles on the instant, I am certain not to agree with you; no, not even if the power of the multitude could inflict many more imprisonments, confiscations, deaths, frightening us like children with hobgoblin terrors. But what will be the fairest way of considering the question? Shall I return to your old argument about the opinions of men, some of which are to be regarded, and others, as we were saying, are not to be regarded? Now were we right in maintaining this before I was condemned? Translation: Look, Crito: just because it would be convenient for me to not get killed and run away to another city-state, I can’t just all of the sudden abandon my allegiance to doing and acting in accordance with the best evidence we can establish, even if many people wouldn’t fault me for running. Their opinions don’t matter; the evidence of what we know to be right does. It turns out, Socrates, thinks the evidence suggests he should stay, and so he willingly drinks the hemlock. This passage interests me both as a former philosopher and current librarian, for it sets out something I’ve believed all along: what matters when it comes to our beliefs and practices isn’t really what people think of them, what matters is what the evidence suggests. This turns out, unfortunately, to be a way more radical opinion than one might hope, but whatever. My interest here is in applying this to a specific context: the relationship between academic librarians and the faculty we often teach for. We all, I think, notice this phenomenon where librarians feel, for whatever reason, sort of subordinate to faculty, and have this desire to please them and do whatever they ask for. I’ve never really had that desire, and I suspect that comes from, as it were, having formerly come from their ranks myself – but I think I have a valuable service that can help students learn something important and am happy to collaborate with other faculty members toward achieving our mutual goals. And, of course, I seek out such collaborations extensively. This seems to me as it should be. But here’s something I notice again and again that I think is an offshoot of this whole “we’re subordinate to faculty thing”: librarians take faculty approval of what they did in the classroom as evidence that their instruction was successful. Example: The faculty member asked me to show their students CQ Researcher and 97 other databases for 50 minutes and they liked it and invited me back; therefore [insert conclusion: the instruction was successful, I’m a good librarian, etc]. Well, friends, this is the conclusion that I think is horribly wrong. With Socrates in mind, I think it’s pretty clear to see that a faculty member liking something you did in the classroom has literally no relevance to whether or not it was actually good, or valuable, or worth doing. Your job as a librarian is to teach students stuff (whatever your learning outcomes happen to be). And some person liking the thing you did is not evidence that your students learned the thing you wanted them to learn. So I would really love to put a kibosh on this idea that faculty members liking what you did has anything to do with anything other than pragmatic considerations: yeah, you want them to like it because you want to get invited back. I get that. But it’s not evidence that what you did was valuable, or promoted student learning, which is your entire reason for existence – not to be liked by a faculty member. Let me be clear: I say this as someone who overwhelmingly has really excellent relationships with other, non-library faculty members and has engaged in collaborations with faculty at low levels, high levels – on research, on course design, on teaching, on pedagogy, on all kinds of things – and I think such collaborations are fun, enormously valuable, and are to be pursued. Aside from working with students, it’s the best part of my job. What they’re not, however, is an actual measure of whether your instruction was successful. Approval is not evidence of student learning. Not to get too Zen on you, but I’ve found, incidentally, that the quickest way to faculty members’ approval is to forget about their approval, learn a bunch of stuff about pedagogy, and to incorporate that into my lessons to help students do research (my job), which in turn helps students better do the thing faculty members care about (having students do better research). That (and, I suppose, a penchant for saying funny things sometimes) holds me in good stead, and establishes good rapport with other faculty, more than anything else. So forget about being liked so much and just do your thing, librarians. Your students will be better off for it.